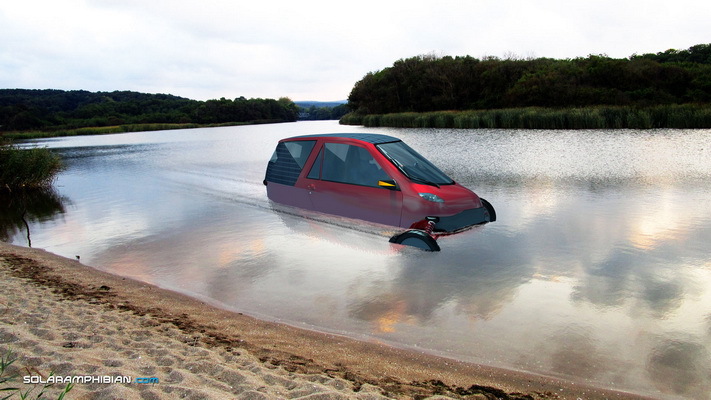 In short – a solar car, velomobile and jet-ski hybrid. It is all-in-one vehicle, powered mostly by the Sun. Inde could be the next big thing in the personal transportation. It is super-lightweight, fast, reliable, has a long mileage and comfort, and usually you don't even need to charge it. And even more – you may sail on the fly. We are dedicated to create a new type of vehicle for everyday use, something even better than the ordinary electric car. Everyone have seen competitions with solar powered cars, but never one in production. 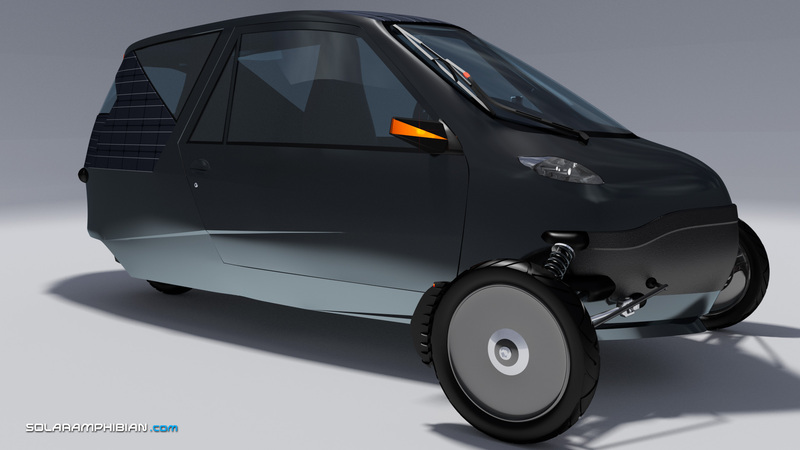 We stick to the existing technologies, but combining the best of everything is the key – solar panels, electric propulsion, lightweight Li-ion batteries, human pedaling assistance, super-lightweight materials and a comfort of a car. And of course – a water propulsion. Inde has a relatively small battery pack. The normal velomobiles are driven mostly by the human power, they do not need a large battery pack, even no battery at all. But Inde has two spacious seats and needs more power. This is compensated by slightly larger battery and solar panels on the roof, aside, and on the back. 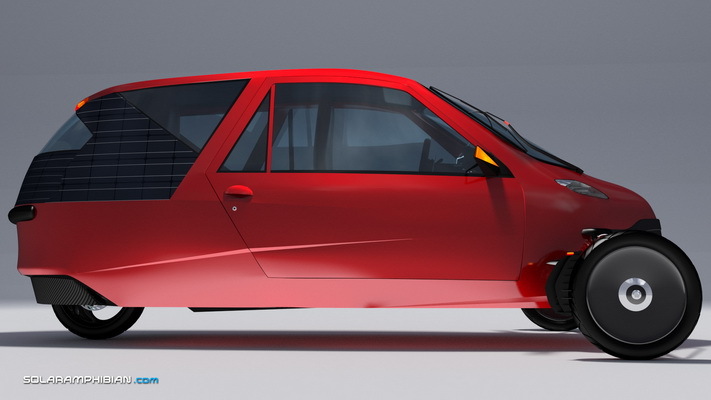 This allows extended range at a higher speed, which is more close to an ordinary car, than a single-seat velomobile. Ths is the next step to a better and greener transportation. What makes Inde a better option? It is amphibious – go sail for fun or shortcut a great distance. Extended range. The solar power from the photovoltaics provides extended range and less charge from the electric grid. If you pedal more often or if you do not use it daily, it is possible to go without charging for a long time – a completely free transportation. High speed and a small battery. Inner space, comparable with a mid-class car. Two seats – a driver and a passenger. Trips with 3 or more people are quite rare (statistically – less than 10%). Inde has a comfortable seat position, unlike the recumbent velomobiles (because of the need of low gravity center and better aerodynamics). Full suspension on all of the 3 wheels. High level of comfort – heating for winter, wiper, fully enclosed and lockable cockpit and trunk, car-grade front lights. High level of safety – seat belts, breaks on all of the wheels, safety glass for the windows, wide front wheels track. All wheels drive. Indeed it has 3x3 transfer case – the rear one is electric and the two front wheels are powered by pedaling. And you may "engage it" whenever you like just by pressing onto the pedals. For all specificatrion visit the Features page. 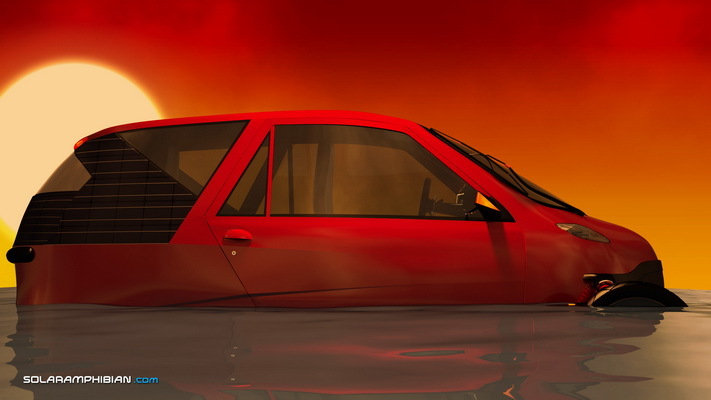 It's a solar powered amphibian velomobile (amphimobile). Maybe this sounds unusual, but actually we could use it quite often. We use to think about the amphibians as service vehicles, exotic transportation or a military assault. But it's not... many people even could use it daily. We will offer the amphibian feature without any surplus charges. This feature is almost free! Here are the available Inde body colors. Click to preview a picture of the vehicle.